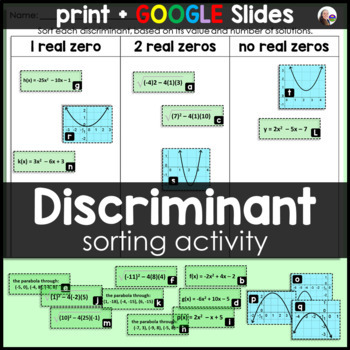 Students look at graphs, determine a, b and c from a quadratic function, sketch a parabola between 3 points or simplify a filled-in discriminant before sorting into one of the 3 categories. There are 20 cutouts to sort. Students get practice with identifying A, B and C and evaluating b^2 - 4ac correctly, which can sometimes be tricky! 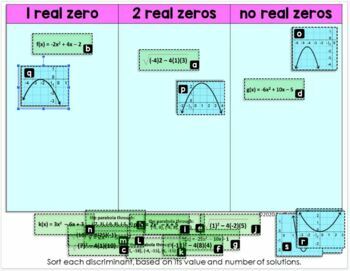 Students sort their cards onto a sheet with boxes for "1 real zero", "2 real zeros" and "no real zeros" to organize their thoughts and then complete an answer sheet to submit. You can see a completed sort and the answer sheet in the thumbnails and preview. An answer key is also included.